Apparently this is the year of the wind in The Bahamas. We definitely wish we had a wind generator. Strong winds have delayed us from moving on to our next stops, they have caused us to stay in protected anchorages, and they have kept us from snorkeling. The temperatures are in the high 70’s with low humidity so it’s hard to complain. 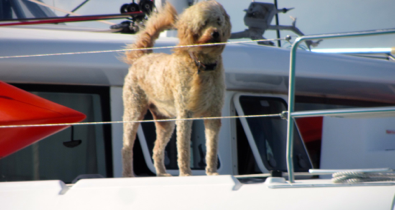 The wind is now out of the E and SE and blows between 15 to 25 kts every day. In order for us to continue down the Exumas chain, we would be going directly into the wind. However, most of the cays are quite close together, so a short uncomfortable sail or motor on the shallow banks to the next one is OK.
Today, Interlude and Southerly II left Big Majors and went about seven miles to Blackpoint. We’ll miss traveling with them but will see them again since they are headed to Georgetown and we’ll get there eventually. The six of us played numerous games of Mexican Train and we even learned to play Texas Hold’em one night. (Much to the dismay of the others who knew what they were doing, I won having never played poker before.) We shared meals and lots of sundowners. It’s not unusual to meet other cruisers waiting to leave Florida or shortly after arriving in the Bahamas and becoming boat buddies for awhile. We are staying here to wait for the arrival of our air card and 12V computer charger ordered on Amazon. 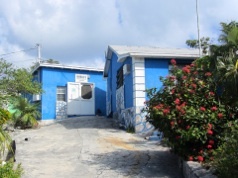 They will be at St. Brendan’s, our mail forwarding service in Florida, tomorrow, sent to Ft. Lauderdale the next day, and the package should be delivered to Staniel Cay on Watermakers Air out of Ft. Lauderdale on Friday. Then we need to get a sim card for the air card at Batelco, which is only open M-F. We might have to wait until next Monday to get that done. Then we’ll probably head to Blackpoint, or we might go a few miles back north to Pipe Creek and Compass Cay, which are favorite spots to hike. We aren’t in a hurry to get anywhere but we had to pass several planned stops coming south to get to this protected anchorage at Big Majors. We are disappointed that we haven’t been able to snorkel yet. The wind and current make it difficult to go in the water in any but the most protected areas. We checked out Thunderball Grotto today and I think we will try to snorkel in it at slack tide tomorrow. 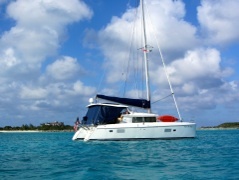 It is located a short dinghy ride between our anchorage and Staniel Cay. 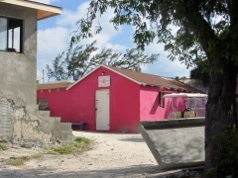 Today we went to the Staniel Cay town dump. You can pay to get rid of your garbage in town, $2.50 for a small bag and $5 for a large one. We have quite a bit of garbage because we haven’t had a place to get rid of it since we were in Nassau nine days ago. The dump is a dinghy ride and short walk, so we brought our garbage bag to it, strapped to a dolly. 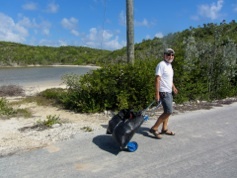 Besides our garbage we probably had over 20 poop bags from Daisy’s beach walks since we left Nassau. We always pick up after her because lots of people walk on the beautiful beaches. Sadly, all dog owners don’t. We also stopped at Isles General again as well as the Pink and Blue grocery stores. The latter are located in small houses and it’s obvious how they got their names. We asked when the supply boat would be coming in again and the lady at the cash register at Isle General didn’t know. She said ”It’s on its way but it’s going south and I don’t know when it will get here.” Apparently there is no schedule. You just watch for the huge boat to come in to town and then you jump in your dinghy and rush to the stores while the fresh food is still available. Once we get to Georgetown, we’ll be able to shop at a regular grocery store. Until then, all of the stores are in houses and get weekly deliveries to stock their shelves. Luckily, we have all the food we need except for fresh vegetables.